A feature of Brainy's Share Market Toolbox. using specific technical analysis criteria. The resulting list of stocks is published each week as Robert's Weekly Watch List. Robert's Weekly Watch List (WWL) is a list of stocks from the XJO index (S&P/ASX 200) which have their share price in an uptrend, and the list is sorted into a particular sequence (based on a complex set of technical analysis observations). What is the purpose of the table? Many people spend a lot of time searching for the ideal stocks in which to invest. This table is simply a list of the stocks (updated weekly) from the S&P/ASX200 (XJO) index which are in a rising trend (as defined below), and sorted into a sequence based on key technical analysis criteria (see details below). In other words, we look for bullish observations of technical analysis chart indicators (this topic featured in a public presentation in late 2017 and 2018 - see the slides here). Sometimes, when we look for possible investing candidates, we end up with a list of several stocks and we don't know which one to go with. So this list helps to overcome that problem. The stocks are ranked on the list and sorted into a sequence based on key technical analysis criteria - or "bullish observations of T.A. indicators". Therefore, the stocks near the top of this list are theoretically more likely to be profitable over a period of time. What do we mean by "theoretically"? And how do we define "more profitable" and over what time period? These questions are discussed below, and in the Toolbox (Premium) Member's section. A successful trader/investor who uses what we call "discretionary trading" methods, relies on their ability to interpret the stories on a price chart without using any specific stock selection strategy. They can be successful provided they have a good knowledge of a few chart indicators, and are able to successfully gauge the likelihood of future price moves. Don't forget that when we use technical analysis we are playing the probabilities regarding future price movements - it is not 100 percent guaranteed. This Weekly Watch List is an attempt to do what the discretionary trader does - make observations of specific elements of price chart indicators, to gauge the probability of future price movements. Which chart indicators do we use here? And which elements of them do we use? See the details below. Why not use a mechanical strategy? Firstly, it it important to understand that many thousands of different stock selection strategies exist, and there is nothing wrong with them. Some investors/traders prefer one strategy over another, and some prefer to trade using a very mechanical approach with thorough back-testing. There is nothing wrong with any of this. And it has to be said that a successful strategy for one investor might not work in the hands of another investor. Secondly, it is important to also note that in my experience of eye-balling price charts each week, I have found that my Weekly Watch List (WWL) approach described here is successful in producing a ranked, and sorted list of stocks. And I have found that the stocks with a Score greater than about 50 tend to be somewhat bullish over the latest couple of weeks. However, I would not buy all of those stocks because my reading of some of the price charts shows current price weakness which might continue. This leads me to believe that until I can spend a lot more time to fine tune the approach, then I will always want to eye-ball a price chart before making the final decision to buy a stock. That is, I will not rely totally on a mechanical approach. So, why have we chosen the approach described here? Well, firstly, in this strategy we are looking for the stocks in a rising trend (using one definition for "trend"). Then we want to quickly sort the selected stocks into some form of sequence based on share price strength and momentum. One possible way to do this is using the approach described below (with more details in the Premium Toolbox Members section). Robert also analyses the state of the Australian share market on a weekly basis, and shares the analysis with Toolbox subscribers in his Weekly Analysis and Update email. See more details here, and see recent analysis comments and overview charts are available here for public viewing. Premium Toolbox Members can see the latest Weekly Watch Lists here, as well as archived copies of past Watch Lists. And there is information about exactly how we choose the stocks for the Watch List, and what we do with the list now that we have it. See the How-To-Join information with details about how to become a Toolbox Member. Robert would be happy to occasionally send you the Weekly Market Analysis email with a summary of the latest Watch List details, or simply keep you informed of new information as it becomes available. See the sample (above), and click to see the sample in a new window (this is a recent version of the list; but not the latest). Near the top of the page, in the upper right-hand corner, is a small colour-coded table with text. The text and colours together summarise the current "trend" of the market index. This is a list of all of the stocks on the list this week, including the carry-over stocks from last week, and the new ones on the list this week. This is a list of the stocks that were on the list last week; but which have been removed this week, simply because they no longer conform to the selection criteria - see below. How do stocks get onto the table? 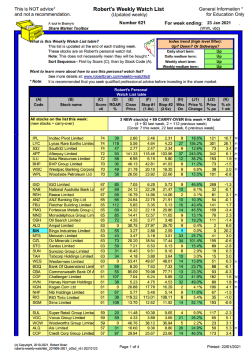 Robert runs a market scan each Friday night (using BullCharts software) and those which meet the selection criteria are added to the list. See the selection criteria details below. The stocks on the list are considered "worth watching", for the simple reason that they qualified to be listed based on the selection criteria. However, just because a stock is listed does NOT automatically mean it is a candidate for purchase, nor is it a recommendation to purchase, and it is NOT advice of any sort. The “Score” that is calculated and included on the list is used to rank the stocks into a sequence. It basically uses key characteristics (ie. "bullish observations") of several technical analysis chart indicators. More details are included on the Premium Toolbox Members page. What are the columns in the table? How are the rows of information sorted in the Watch List table? See details below. For more information about the Weekly Watch List table, and how the stocks are selected, and what we do next, is included in the Frequently Asked Questions section in the material below. If you are ready to take that small step to become a Toolbox Member, see the How-To-Join information with all the details. If not, see the Frequently Asked Questions below. NO! - This is definitely not advice of any sort. We do not have an AFS License, nor does he take your personal financial situation into consideration. So there is not way that this information can be advice. This information is for education only. There is NO recommendation here to buy or sell and stocks, nor any other sort of investment. before making any investment decisions. It can be said that any investing or trading strategy might be successful for one person, but not successful for another. This is due to a number of reasons, including one's own risk tolerance and psychological make-up. Is this a list of Hot Stock Tips? Robert's Weekly Watch List might look like a list of Hot Stocks, or it might look like a list of Stock Tips - what to buy and what to sell. But it is not this at all. Robert might treat the list in this way because it suits his purpose, his strategy, and his investing risk tolerance. Robert's Weekly Watch List is being shared as a sample application of how to use technical analysis for selecting possible investment opportunities. By following the links, and understanding the concepts, we can see the investing and trading strategy being used. We start off with a list of preferred stocks. Once each week on a Friday night we "scan" the preferred stocks to identify those that meet certain selection criteria. If a stock meets the selection criteria, then it is included on the Weekly Watch List. The stocks on the Weekly Watch List are all allocated a Score. All stocks on the list are sorted based on their Score value. Preferred stocks - Which stocks do we select from? For this "Weekly Watch List" strategy we are looking only at Australian listed companies. We want to minimise the risks - so we exclude speculative stocks. When we decide to exit a position, we will want to be able to exit the position quickly - so we will avoid illiquid stocks (ie. stocks which don't trade frequently enough, or which have very low turn-over). Stocks with relatively high debt levels have a greater risk of defaulting on their debt when times are tough - so we will avoid these stocks as well. 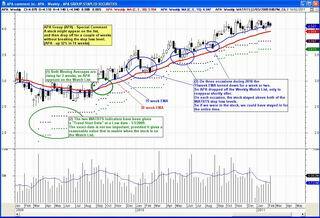 The criteria that we use here to put a stock onto the Weekly Watch List is based on the notion of a rising Moving Average. This is one way to quickly spot a rising trend - more details on trend-spotting here. In fact, for this strategy we look for two Moving Averages to both be rising for 3 weeks. The sample chart at right is a lovely example of a healthy rising trend (click on the image for a larger version in a new window). Note how much this share has risen in price, and over what time period - not bad. But which two Moving Averages do we use? - See the details in the Premium Member section of the Toolbox. Trends - "The Trend is Your Friend"
The first plank of our stock selection strategy is the notion of a rising trend. If we can spot a reliable rising trend in share price, and then ride the trend, then we are at least half way there. as well as more details on the Trends page. Each of the stocks that is chosen to be included on the Weekly Watch List is allocated a Score. This score is calculated as a part of the BullCharts scan, using the BullScan criteria, and each scan criteria is assigned a "weighting". A stock that meets all criteria ends up with a "Score" of 100 out of 100. If a stock does not meet some of the criteria, it's "Score" will be less than 100. If a stock meets none of the criteria, then it is not on the list at all. The details of these scan criteria and the score calculation are available to Toolbox Premium Members here. There are some clues in the next section below "Tell me more about...". Note that the calculation of the Score value was revised in March 2017 after months of review and testing, and now provides a more accurate indication of the technical analysis interpretations. After watching and studying the revised score calculation method, it is apparent that any stock with a score of less than 50 is showing a lot of price weakness on the chart, whilst stocks with a score value of 50 or more are showing a tendency to share price strength. The maximum score value seems to be 80 out of a possible 100. Okay, so we have the Weekly Watch List (WWL) table, with a list of stocks sorted by a "score" value, so what do we do next?. Based on experience, and lots of chart eye-balling, it seems as though we then need to eye-ball the stocks with the highest score value, in order to weed out current price weakness that is not reflected in the score value. Article ST-6405, "Robert's Weekly Watchlist" (page1 here). ST-2420, "Trading Plans and Trading Plan Template" (page1 here). ST-2430, "Trading Strategies (and Template)" (page1 here). Article TA-6050, "Robert's Weekly Watchlist Strategy" (page1 here). This article talks about money management and risk management, and the stock selection criteria in terms of technical analysis. That is, rising Moving Averages, the ROAR, a rising MACD, Momentum, and the exit criteria (Wilson ATR Trailing Stop). New eBook Article TA-6055, "Robert's Weekly Watch List V6" (page 1 here). Article BC-10-400, "Scans - Match (not) all criteria" (page1 here). This article includes a discussion and demonstration of how to use the BullScan weighting factors to determine a "Score" for each selected stock. BullCharts - Determining a "Score" value. New eBook Article available shortly. Article TA-6150, "Alan Hull - MMA, Range, ROAR" (page1 here). Article BC-26-200, "Author Strategy - Alan Hull (and ROAR)" (page1 here). This 8-page article covers a number of topics including: the Alan Hull ActVest and ActTrade strategies and indicators that are included in BullCharts; ROAR; ROAD; the Range+ indicator; Hull MMA indicator; the relevant BullCharts market scans and templates; and Brainy's own very useful BullCharts template to display the Range indicator on a weekly chart with the daily candles superimposed. Article TA-4230, "MACD - Moving Average Convergence Divergence" (page1 here). This 7-page article includes information on the MACD indicator, and the MACD Histogram, as well as the notion of MACD Divergence. Article TA-4610, "Momentum Indicator" (page1 here). This article discusses the Momentum indicator, and also discusses the notion of a Moving Average of Momentum (using 28-periods). Make sure to see information about Exit Strategies (web page). Public web page on Stop Loss. 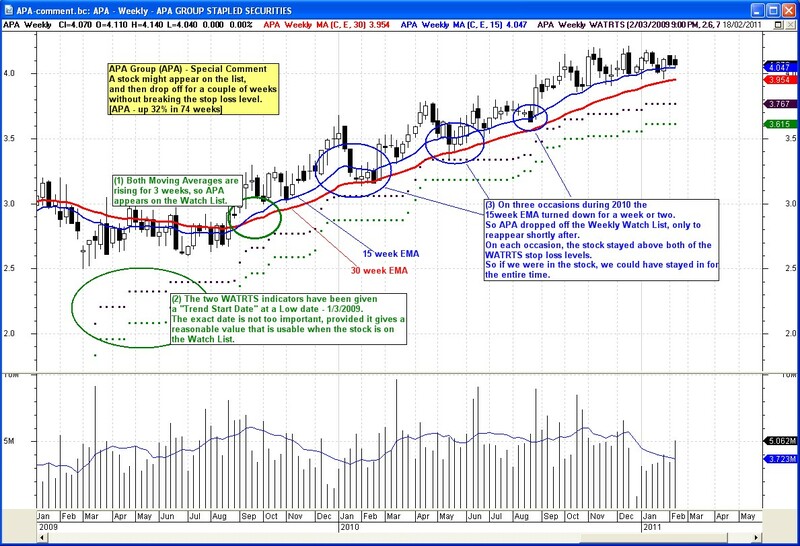 Article TA-5100, "Indicators and Tools for Stops" (page1 here). 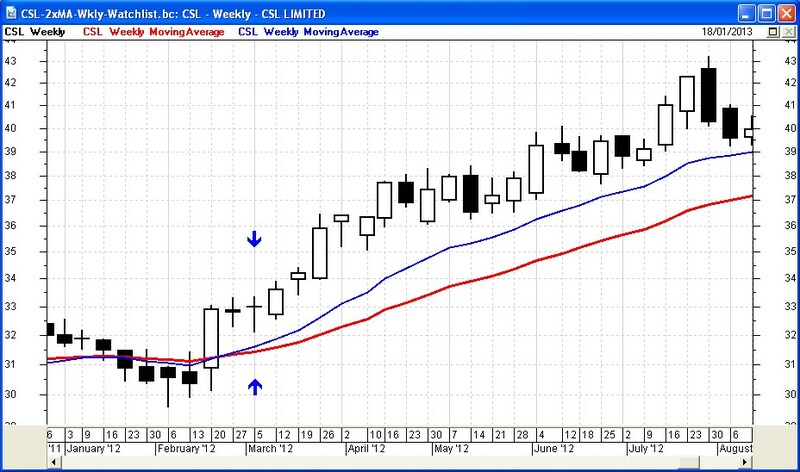 This article includes information on: Count Back Line (CBL), the various indicators that can be used for stops (eg. P-SAR, JB Trailing Stop, ATR Trailing Stop, etc. ); and a discussion of the Wilson ATR Trailing Stop. Also see the Presentation slides "Seven Ways to Determine a Stop Loss Position", or a more basic introduction "Stop Loss - Introduction". Is this information reliable? Has it been tested? A specific stock selection strategy has been used to identify the stocks to appear on this Weekly Watch List. This strategy has been back-tested using BullCharts and TradeSim over specific date ranges. However, there are two difficulties with back testing this specific approach. Firstly, by utilising the Wilson ATR Trailing Stop, it is necessary to manually identify the start of each trend, so as to determine the stop loss values. This makes the back testing very difficult over more than very short time periods. Secondly, the manual experience of eye-balling the price charts has suggested that a degree of discretion is needed to optimise the stock selection before an entry is made. We are still struggling with this issue. To address this, either manual back-testing or some detailed paper trading is required. We are happy to send you the Weekly Market Analysis email each Saturday, which includes relevant comments and the links to the latest Weekly Watch List table. To get this, all you need to do is subscribe to Brainy's Share Market Toolbox as a Premium Toolbox Member - more details are here. See the How-To-Join information with details about how to become a Toolbox Member. Not convinced about Toolbox membership? See the reasons why you should join. How is the Watch List information prepared? All of the charts and the watch list results are produced and derived using the Australian BullCharts charting software. The market is scanned using the BullScan tool with specified selection criteria, and price charts with indicators are viewed using the BullCharts software as required. The columns in the table? The stock code (eg. BHP) and stock name. ROAR percent value (Rate of Annual Return). Close price at the end of the week. Two possible Trailing Stop positions, using the Wilson ATR Trailing Stop (WATRTS) chart indicator. The number of consecutive weeks that the stock has been on the Watch List. The percentage change in price since first appearing on the Watch List. The percentage change in price since first appearing on the Watch List - annualised (ie. per annum). The percentage change in price in the last week. The sort sequence for the rows in the table? "New and Carry over" - The stocks that are new on the list this week, as well as the stocks that were on the list last week. Stocks that were on the list last week; but are gone off the list this week. By SCORE, so those with the highest score are at the top of the list. For any stocks with the same SCORE, they are simply sorted by Stock Code. What? Some of these stocks are losers? Remember, whenever stocks drop off the Weekly Watch List it does not mean that they should be sold (if owned). Remember the criteria for entry onto the list (two rising Moving Averages), and our own Trading Strategy criteria for selling the stock. If we view the charts for the stocks that have gone off the list recently, there are usually some that fall and eventually trigger the Stop Loss, while others eventually rise again. One way to help explain this situation is to see the sample chart at right (click for a larger image) of APA. We should always compare the latest share price with our pre-determined Stop Loss level and sell if the Stop has been breached, and continue to monitor in coming weeks. Also, it's important to remember that some of the stocks on the Watch List will lose money (fall quickly before triggering the stop and realising the sale). That's one of the facts about investing and trading. BUT, with proper "money management" our portfolio can still come out in front!! This is because if we cut our losses short, and let our profits run, then the accumulated profits should be greater than our losses. Even if we have a win to loss ratio of 50%! That is, if we have 5 wins and 5 losses, we can come out ahead provided our profits are larger than our losses. Why is a stock "off the list" if the WATRTS is not broken? Our selection criteria says that to be "on the list" a stock must have two specific moving averages increasing for the last three weeks. Now, it is possible for one of these moving averages to stop increasing for a week or two, because the share price is taking a "breather"; but for the price to stay above our Stop Loss level (the Wilson ATR Trailing Stop). And the price can then continue to rise, and cause both moving averages to rise again. So, why don't we fiddle with the selection criteria to keep these on the list? There are two reasons: The stock might be showing early signs of weakness, in which case we can monitor the stock and be on guard in case of a pending fall. Secondly, a temporary sign of price weakness might be an opportunity to enter the stock again at a cheap price. Some stocks on the list do nothing for the first few weeks - Why? This observation is a common occurrence with stocks that break out above resistance, of from a recent trading range. It can often be seen in different time periods (on daily charts, or weekly). The stock breaks out, but some people want to recoup their investment at these recently high prices so they sell, and with the excess of sellers in the market the price falls away. But once these sellers are gone from the market, then only the buyers are left to take the stock on to higher highs. When they fall, the stock can even fall lower than anticipated; but it can stop falling at a recent support level which might be the bottom of a recent trading range. A picture tells a thousand words, and this is one it is useful to view the price chart. This process can take several weeks to unfold. An updated graph of the number of stocks on the list is sometimes included as the last page of the Watch List Table PDF document. The graph (sample at right - click for a larger version) shows the key statistics from the Watch List table back to January 2010 (that''s when I started tracking this). Since early 2019 the graph now runs across two pages, because it got to be rather cramped and difficult to interpret. If you focus on the second page of the graph, and look at the peaks and troughs across the chart over the last four years, we can see that the graph swings sharply from one extreme to the other. 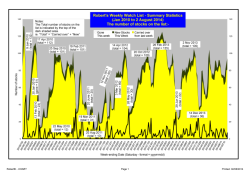 The graph shows how the number of stocks on the list from week to week (or month to month) fluctuates between extremes, and since the start of this graph (January 2010) the total number of stocks on the list has been above 120 only twice. And it has dipped to between 20 and 40 a few times, and fallen as low as 10 in August 2011. We can note on this graph that when the total number of stocks on the list peaks, it often then falls significantly. You can study that graph and draw your own conclusion about whether we might see many more stocks drop off in coming weeks or not. On the graph we can see that the number of stocks on the list does get to as low as about 20, but not much lower. It has done this several times over the years, and then tends to recover fairly quickly. This graph is sometimes included as the last page of the Watch List PDF document (it shows the number of stocks on the Watch List over time). Toolbox Premium Members can find a recent graph in a recent Weekly Watch List document in the Archive. More information about the TOOLBOX MEMBERS AREA. ©Copyright 2009-2019, R.B.Brain - Consulting (ABN: 52 791 744 975).